Our parallel twin screw extrusion PET bottle flakes gran ulator recycling machine for making recycled pellets. 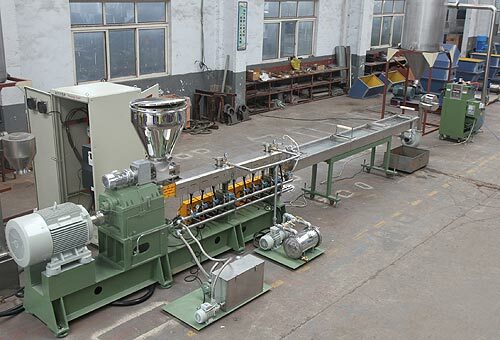 Lianguan Recycling Company series of parallel twin-screw extrusion pelletizing machine is used for recycling PET bottle/sheet/film flakes, regular solid polymer flakes, and polymer compounding. 1. Simple design, user-friendly operation. 2. Precise temperature controlling. NO hydrolyzing. NO yellowing. 3. IV reduction less than 0.06 dl/g( tested based on clean and dried PET flakes). 4. Lower investment cost for a high quality and durable machine. 5. Low energy consumption, High output capacity. 7. Engineers are available to do commissioning work abroad. FOR MORE DETAILS OF PET Flakes Granulator, PLEASE FEEL FREE TO CONTACT US. LIANGUAN RECYCLING provides complete pet washing line and pet pelletizing line solutions, such as pet bottle crusher, pet bottle label remover, pet bottle steam boiler, pet bottle dewatering machine, pet bottle bale opener, manual sorting table, high speed friction washer, pet bottle dealkalization machine, pvc label separator and other complete pet flake granulating lines, including of screw feeder, hopper drier, parallel twin screw extruder, Counting feeder, hydraulic screen changer,noodle pelletizer die-head, Water cooling tank, Wind dryer, noodle pellet Cutter, Vibration screen(optional), and other machines which are suitable for making pet pellets&granules, etc.